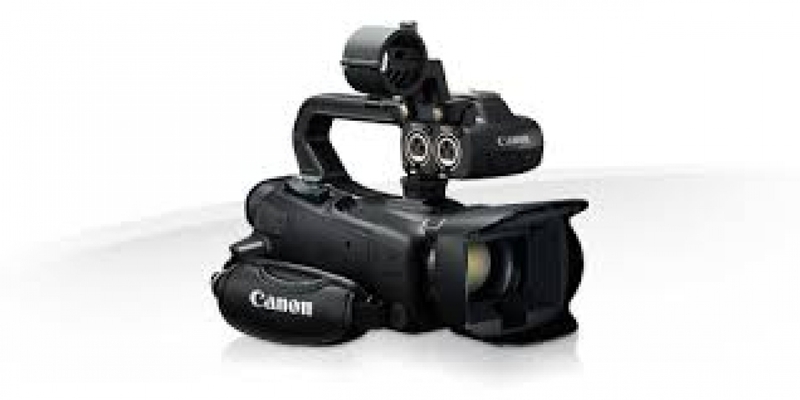 Combining a compact form factor, professional video features, and an HD-SDI output, the PAL Canon XA35 is well-suited for "run-and-gun" ENG productions, event coverage, corporate videos, and other applications that require a compact, broadcast quality camera. Please note that this camera is designed for European broadcast systems and is not compatible with NTSC systems. It is equipped with a 20x Canon optical zoom lens with a versatile 35mm equivalent range of 26.8 to 576mm, and features a 1/2.84" HD CMOS Pro sensor with enhanced sensitivity, for improved low-light performance over the previous model. To fit into your workflow, the camcorder captures video up to 1920 x 1080 at 25p, 50p, and 50i, while also offering Slow and Fast Motion recording modes, with the option of interval recording for capturing fast motion at up to 1200x the original speed. The XA35 features both a 3.5" OLED Touch Panel view screen with a 10,000:1 contrast ratio, and a color electronic viewfinder with 1,560,000 dots of resolution. The camera features full manual control and auto modes for exposure, focus, white balance, gain, and shutter speed. The camera provides professional features such as a pre-record buffer, peaking, zebra bars, color bars, and reference tone. The zoom speed is adjustable with variable, constant (with 16 different speed levels), fast, normal, and slow settings. It features a detachable top handle with zoom toggle, record start/stop, IR emitter, tally light, accessory shoe, external mic holder, and two XLR connectors with phantom power and manual audio level controls. The XA35 includes a built-in headphone jack, a Mini HDMI connector, and a 3.5mm four-pole mini jack that outputs composite video and audio. For connecting with professional video equipment, the XA35 also features an HD/SD-SDI output for direct connection to news truck, an SDI switcher, or other professional video equipment. It also enables external recording of uncompressed video signals. The XA35 features a new 1/2.84" HD CMOS Pro Image sensor that captures approximately 2136 x 1362 pixels. It features a +3 dB improvement in signal-to-noise ratio compared to the previous model, allowing it to capture clearer and sharper images in low light conditions. The Canon 20x HD Zoom Lens provides a zoom range with a 35mm equivalent of 26.8 to 576mm, and a minimum object distance of just 23.6". The lens features an eight-blade iris design providing a more natural look—out of focus areas are smoother and more appealing. The lens features an endless-type manual focus/zoom ring, and the built-in power zoom control includes user-programmable direction and sensitivity modes. Zoom speed can be set to variable, constant (with 16 levels), with fast, normal, or slow speeds. The XA35 offers multiple recording modes, resolutions, and frame rates, giving you the ability to adapt to a variety of workflows and applications. It can record in Full HD 1920 x 1080 resolution up to 50p, in both AVCHD and MP4 recording codecs, at multiple bit rates, and even simultaneously to dual SD cards. For documentary and independent film work, 25p frame rates are available. An HD/SD-SDI output terminal allows the XA35 to connect directly to professional video equipment, such as an SDI switcher, external recorder, or a news truck for broadcast streaming. The HD/SD-SDI output provides an uncompressed signal at 1920 x 1080 resolution with 4:2:2 color sampling, embedded audio, and timecode. Dual-band Wi-Fi (5 GHz and 2.4 GHz) support is built into the camera, allowing FTP file transfers of MP4 video to cloud-based servers for convenient backups or situations where a relay station, such as a news truck, is unavailable. It is also possible to connect to compatible networks, wireless hotspots, and compatible iOS mobile devices using the free Canon Movie Uploader app, or play video back on the camcorder's memory cards to Wi-Fi enabled TVs and computers. Wi-Fi also allows remote control of key camcorder controls, such as recording start/stop, zoom, aperture, shutter speed, gain, white balance, and focus via your mobile device. Wide DR Gamma, an option found on Canon's professional CINEMA EOS cameras, compresses high-brightness areas to achieve a wider dynamic range of 600%. By suppressing overexposure in high-brightness areas of the composition, this mode helps achieve a wide dynamic range of 600% to produce seamless tone gradations, resulting in smooth detail, accurate color, and suppression of overexposure and blown-out highlights. The Highlight Priority Mode is a gamma setting that gives an HDR-like quality to your video. By reducing the mid to high-brightness compression of the standard gamma mode, Highlight Priority helps prevent loss of detail in high brightness areas. Designed for display on a bright LCD TV, videos captured in Highlight Priority mode should be shown at a high-brightness setting to help ensure accurate portrayal of the effect. The 3.5", 1,230,000-dot equivalent OLED display provides vivid color and a 10,000:1 contrast ratio. The screen has a viewing angle of over 80 degrees in all directions, which allows you to see a usable image even when viewing at extreme angles. The color EVF is 0.24" with 1,560,000 dots of resolution, and tilts up to 45° to accommodate different shooting positions. A joystick located to the right of the viewfinder, where the thumb rests, enables control of camera settings without having to use touch panel controls. Two SD/SDHC/SDXC card slots are built into the camera, allowing for varied recording options. The XA35 features selectable manual/automatic control on the camera functions, allowing you to choose the best settings for the situation. Functions include Exposure, Shutter Speed, Iris, Gain, Exposure Lock, and AGC Limit. White Balance features six presets (Daylight, Shade, Cloudy, Tungsten, Fluorescent H, and Fluorescent), as well as two manual white balance settings. Additionally, when specific adjustment of the color temperature is desired, the color temperature may be adjusted in 100K increments from 2,000 to 15,000K. The camera's body features five user assignable buttons so you can customize the camera to access features without having to enter the menu system. The XA35 features an integrated mic, and the detachable handle houses two XLR Line/Mic level inputs with +48V phantom power for connecting external mics. The detachable handle also houses the manual audio level controls. Should you choose, the built-in mic and an XLR input can be used simultaneously. For audio monitoring, there is a 3.5mm headphone jack with 16 volume settings which provide accurate audio monitoring. The XA35 is compatible with the optional Canon WM-V1 Wireless Bluetooth Microphone. This feature allows high-quality audio to be recorded from up to 164' away, making it ideal for events, ceremonies, nature recording, and other situations calling for unobtrusive sound recording. With optional earphones attached, the WM-V1 Wireless Microphone can also be used as a two-way intercom.